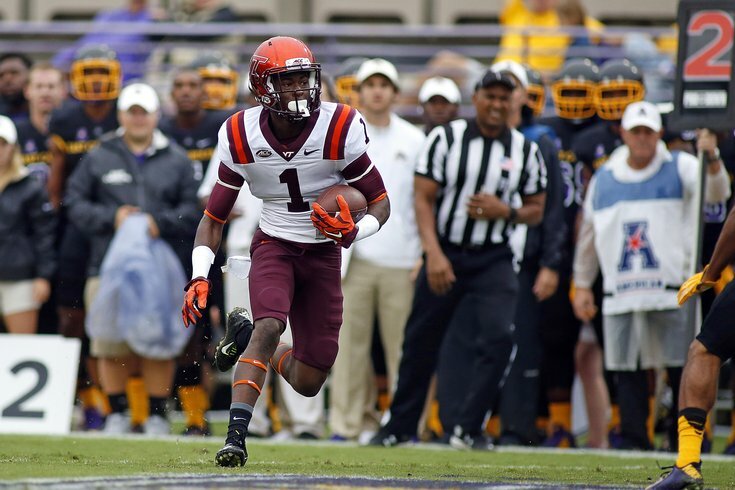 Virginia Tech's Isaiah Ford takes a unique approach to the wide receiver position. He catches the football. Ryan Ramczyk, OT, Wisconsin (6'5, 314): (7) Wisconsin at Purdue, 12:00 p.m.
During a lazy press conference last Friday when there wasn't much in the way of pressing news to cover, I asked Doug Pederson what traits he values in his offensive tackles. "Obviously, athleticism and length," he said. "Those guys are on islands quite a bit, so just the way they move and the change-of-direction stuff inside from pass setting. The ability to pull -- we look for that athleticism there, if they can pull and do the things that we ask our tackles to do, which I think Big V and of course Jason and Lane can all do that. "And you know, just, again, sheer explosiveness off the ball. They're asked to do a lot of things with tight ends and guards and double teams and things like that, and those are all things that you look for when you're looking for tackles: just the feet, how well they move in space, length of arms keep defenders off. All that stuff helps when you're studying tackles." It feels a lot like pass protection is valued more heavily than run blocking in Doug Pederson's scheme, which makes sense, seeing as he is a former quarterback himself, and priority No. 1 should be protecting the face of the franchise in Carson Wentz. Ramczyk is a very special case. He went to four schools before landing at Wisconsin, as he was unsure about his love of the game, even pondering becoming a welder, according to Jesse Temple of ESPN. While that is a nice, folksy story, it is also an enormous concern. Substitute "welder" with "firefighter" and you have Danny Watkins. The Eagles would also have to feel comfortable with Ramczyk's potential ability to play either LT or RT, as he does not have experience playing at a high level of competition at RT. Lane Johnson is going to be the team's LT whenever Jason Peters can no longer play at a high level, so an offensive tackle who can play either side is preferable. Isaiah Ford, WR, Virginia Tech (6'1, 190): Virginia Tech at Notre Dame, 3:30 p.m. He's also feisty as a blocker and as a runner after the catch, although he's not going to rack up a lot of pancakes or broken tackles because of his smaller frame. Catching the football is kind of an important attribute for a wide receiver, as Eagles fans have seen (or rather, not seen) over the last few years. Damontae Kazee, CB, San Diego State (5'10, 190): San Diego State at Montana, 3:30 p.m. Earlier this week, Jim Schwartz emphasized his preference for corners who compete, and Kazee fits that profile. Kazee has the exact same height and weight (5'10, 190) as Eagles slot corner Ron Brooks. He could potentially be a long-term answer as a slot corner in the Eagles' defense. Tyler Orlosky, C, West Virginia (6'3, 295): (9) Oklahoma at (14) West Virginia, 8:00 p.m. The Eagles love Jason Kelce's smarts and have credited him with making life easier on Carson Wentz by making correct line calls. However, it is unknown whether they would prefer a bulkier center who can move defenders in the run game, or if they prefer Kelce's skill set which allows him to get to the edges on screens and sweeps. Personally, as noted previously, I lean toward Kelce being back in 2017, but if the Eagles were to cut or trade him next offseason, they would save $3,800,000 of his $6,200,000 cap number in 2017. If the Eagles plan on going in another direction away from Kelce, Orlosky could make sense in the third or fourth round. Chad Wheeler, OT, USC (6'6, 310): (13) USC at UCLA, 10:30 p.m.
Los Angeles officers responded to a man at around 8:45 a.m. PT (11:45 a.m. ET) who was possibly under the influence of drugs or alcohol, punching walls and windows, and injuring his hands inside an apartment in South Los Angeles near the USC campus, said the law enforcement sources close to the investigation. The man was identified as Chad Wheeler, a junior and an offensive lineman at USC. He ran out of the apartment after hitting at the walls and windows, the sources said. Wheeler was confronted by officers, got into an altercation with them, and was hit with bean bag rounds. The sources did not go into detail about the exact nature of what led police to use bean bag rounds, a less lethal form of force. He was not arrested, but was transported to a local hospital and is being held under protective custody for psychiatric evaluation. Yikes. That's some Lattimer stuff right there. Still, in the post-Chip era, the Eagles showed last year that they are willing to take chances in the draft on character concern players when they drafted Wendell Smallwood, Jalen Mills, and Alex McCalister. If you'll note, they've had 10 players drafted in the first or second round since 2000.